Here's How You Can Help People Affected By Harvey : The Two-Way As the storm continues to dump rain on the Gulf Coast and floodwaters rise, many organizations are doing vital work to help save lives and give comfort. Here's how you can support those efforts. People walk through floodwaters on Telephone Road in Houston on Sunday after 2 feet of rain from Hurricane Harvey pummeled the Gulf Coast. 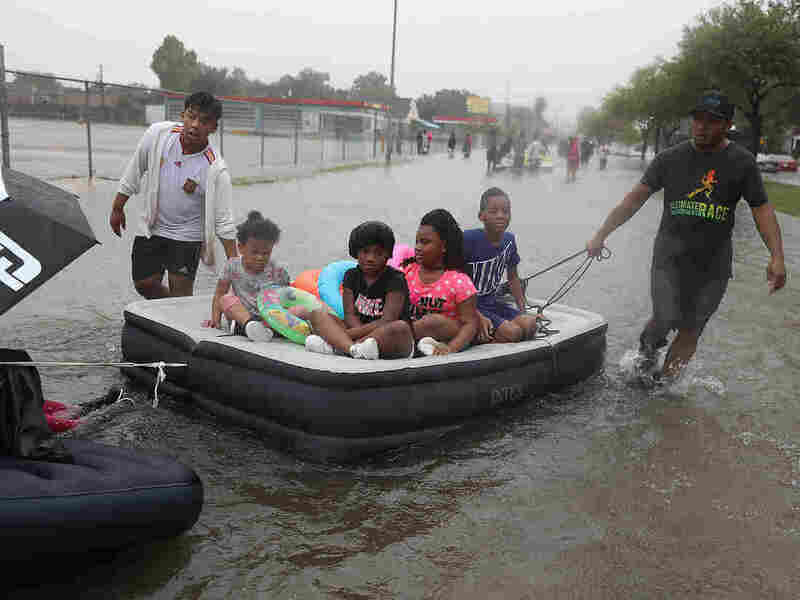 After Hurricane Harvey made landfall and dropped more than 2 feet of rain, thousands of people in Houston and along the Gulf Coast have been displaced. Texas Gov. Greg Abbott activated the entire Texas National Guard. FEMA Administrator Brock Long estimated Monday that 30,000 people may need shelter, and some 450,000 may qualify for federal flood victim assistance. As Harvey continues to dump rain on the Gulf Coast and floodwaters rise, many organizations are doing vital work to help save lives and give comfort. Here's a list of some of the organizations that are undertaking this work and how you can contribute to them. Of course, NPR isn't endorsing or vouching for any of these groups. It's a good idea to do a bit of research on any charity before you donate to it. One place to start is Charity Navigator. Houston Mayor Sylvester Turner established a Harvey relief fund at The Greater Houston Community Foundation. The organization connects donors with a network of nonprofits and innovative solutions in the social sector. GlobalGiving, which calls itself the largest global crowdfunding community, has a goal of raising $2 million for its Harvey relief fund. Funds will be used first for immediate needs of food, water and shelter and then transition to long-term recovery efforts. 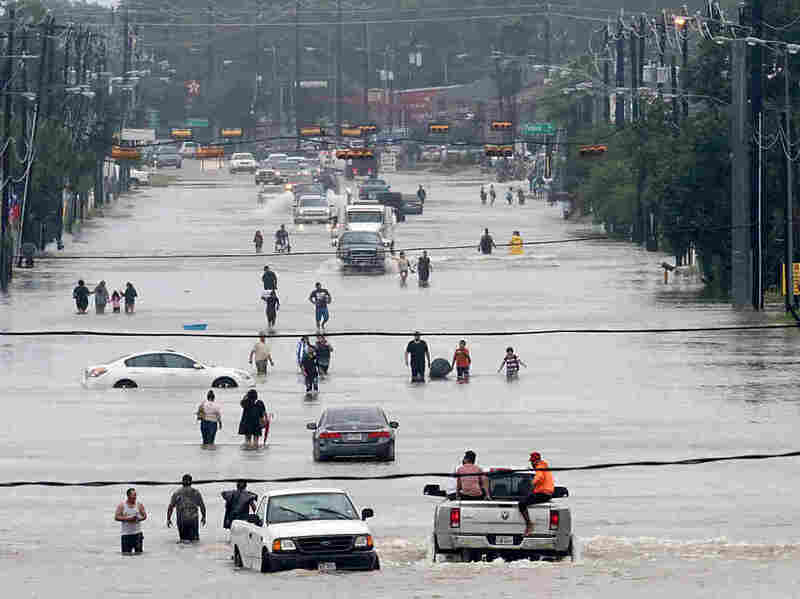 United Way of Greater Houston has launched a relief fund for storm-related needs and recovery. The organization says it already maintains a disaster relief fund but anticipates the needs of Harvey will far exceed those existing resources. The Center for Disaster Philanthropy has also launched a Hurricane Harvey relief fund. The organization says its strategy emphasizes "investing well rather than investing quickly, addressing the greatest needs and gaps in funding that may be yet to emerge." SBP, based in New Orleans, got its start rebuilding in St.Bernard Parish after Hurricane Katrina. The organization provides advisory services to local leaders and nonprofits, and deploys Americorps members to do mucking, gutting, and rebuilding. The organization focuses on using efficient processes to speed recovery. GoFundMe, the social fundraising site, has created a landing page that gathers the campaigns on its platform related to Harvey. The Salvation Army says it is providing food and water to first responders and preparing for massive feeding efforts for residents. Send Relief and Southern Baptist Disaster Relief says its teams began responding before Harvey made landfall and continues on-the-ground relief work. Samaritan's Purse is accepting donations as well as volunteers for Harvey disaster relief for the coming months. 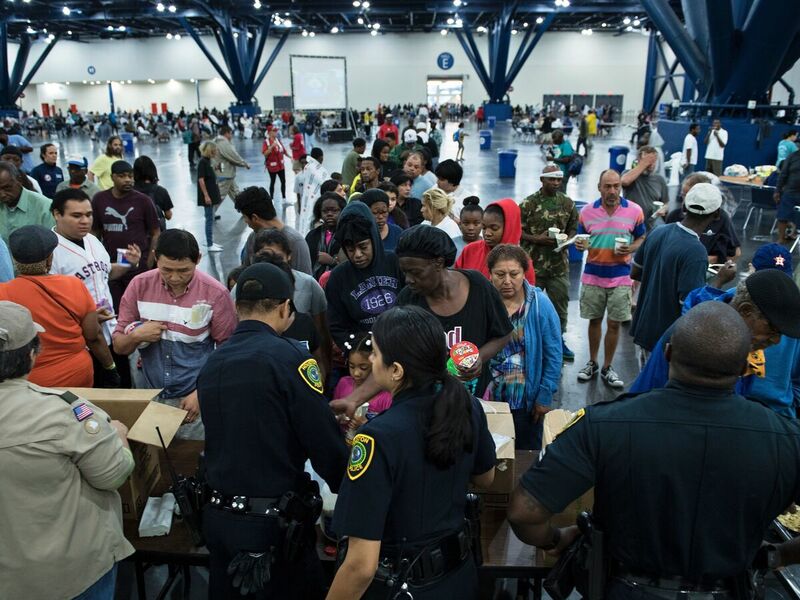 Flood victims gather for food at a shelter in the George R. Brown Convention Center on Monday in Houston. Direct Relief is providing funding and emergency health kits to community health centers in Texas. The contents of the health kits are based on the organization's experience in previous hurricanes, and include items such as insulin, asthma inhalers, and anti-hypertensive medication. The American Kidney Fund has set up a disaster relief fund to help dialysis patients affected by the storm. In addition to the American Red Cross, local organizations accepting blood donations are Carter BloodCare and the South Texas Blood & Tissue Center. Coalition for the Homeless of Houston/Harris County coordinates the city's response to homelessness, serving as "a backbone organization" to groups that offer direct service. It has been providing updated information on shelters with available beds. Airbnb has set up an urgent accommodations site, where people can open their homes to evacuees from the storm or find shelter themselves. Service fees are waived through Sept. 25. A number of food banks will be aiding the affected region. Consider donating money instead of food, as it allows a food bank to use your donation most efficiently. Feeding Texas is a statewide nonprofit that works alongside state and federal relief efforts. The organization says it steps in during major disasters to "coordinate with the state and other providers so that relief reaches families quickly and the 'second disaster' of an unorganized response is avoided." Children on an air mattress are towed down a flooded street in Houston on Sunday. Portlight Strategies facilitates projects involving people with disabilities, including post-disaster relief work. The organization says its hotline for Inclusive Disaster Strategies has received urgent requests from people in need. Noting that many people over age 50 are victims of the storm, AARP Foundation has created a Harvey relief fund. AARP and its foundation will match contributions up to a total of $1.5 million. Save the Children is providing relief supplies and services to help children and families in shelters and other victims of Hurricane Harvey. The Texas Diaper Bank, based in San Antonio, works to meet the basic needs of vulnerable babies, children with disabilities, and seniors. It focuses on providing partner agencies with diapers and goods. The SPCA of Texas is organizing evacuations of pets in Texas (including 123 cats from a shelter in Corpus Christi) and offers resources on pet-friendly housing for evacuees. Austin Pets Alive! says it has transported more than 235 animals to its shelter. The organization seeks donations, as well as people who can adopt animals. It says it has received so many donated supplies that it's running out of storage space, so financial donations are what it needs most. American Humane has deployed two 50-foot rescue trucks staffed with voluteers, veterinarians, and first-responders. They're also distributing 100,000 pounds of pet food and assisting with shelter operations in Houston.